After the first time my dad got sick and returned home from the hospital I used to make oatmeal every morning for breakfast for him and I. I wouldn’t say I mastered making oatmeal, but, I got it down pat as to how much milk to oatmeal to sugar ratio I needed to make the perfect bowl of sweetness and creaminess. Funny thing is, now a few years later I struggle to make oatmeal for just myself. It either comes out too sweet, too blah, too thick or too watery. Somehow I have forgotten the magical combination. Maybe I’ve somehow blocked it out since I can’t have those morning breakfasts’ with my dad any longer. Our subconscious is a funny thing! Thankfully, my slow cooker is the answer and one of best things about it is that I don’t have to worry about walking away while the milk is heating up and ultimately boils over and leaves a mess on my stove. I cannot even count how many times that happened to me. And cleaning up warmed milk is no fun task. After combining all of my ingredients in my slow cooker and letting it cook on low for a few hours I had a delicious breakfast. I topped mine with almonds, but since oatmeal is so versatile you can pretty much top it with anything. Have you seen some of the flavors they sell in the instant packets? I’ve come to realize that I am not a big fan of cinnamon so I think I will reduce the amount I use the next time I make it, or omit it completely. I am sure the honey would provide enough sweetness for it. One last thing, this was the first time I’ve made steel cut oats. 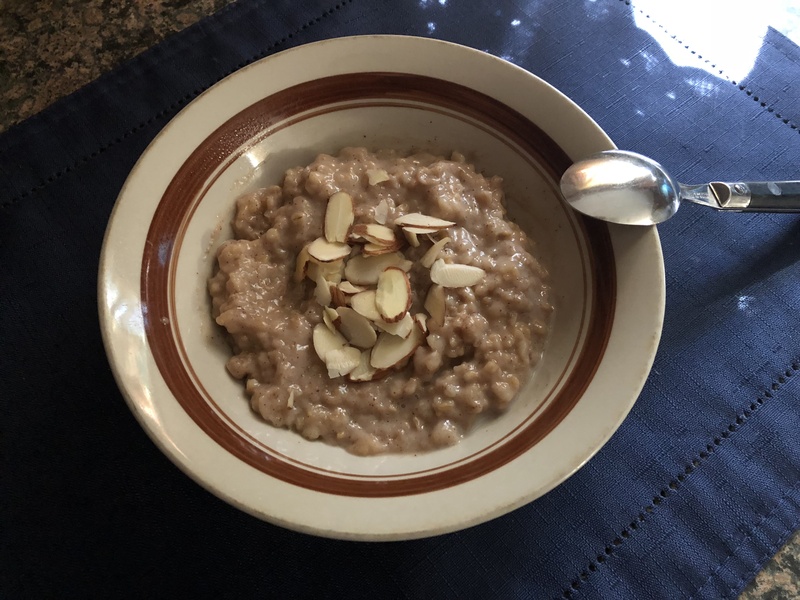 My reason for using them… I thought they would hold up better in the slow cooker since they are not processed as much as much as old-fashioned and quick oats. They take longer to cook due to their texture, but taste just the same. Combine all ingredients, except for the almonds, in your slow cooker and stir until well combined. Cool on low for 4 to 5 hours, or until desired consistency. *I cooked my oatmeal for a little less than 4 hours. I was planning on refrigerating it to eat for breakfast over a few days so I didn’t want to cook it to a point where it was super creamy, it was a bit watery since I knew that as it cooled it would thicken up.